The University of California, San Diego is one of nine campuses of the University of California. 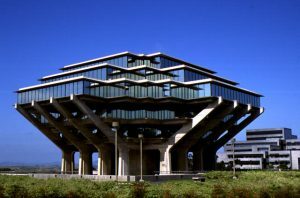 UC San Diego curricula and programs have been singled out for top rankings in national surveys at both undergraduate and graduate levels. Rankings by the National Research Council have placed UC San Diego among the top ten of all doctoral granting institutions in the nation. In terms of Federal research and developmental funding, it is currently in the top six. The Center for Research In Language (CRL) brings together faculty, students and research associates who share an interest in the nature of language, the processes by which language is acquired and used, and the mediation of language in the human brain. CRL is housed in the Cognitive Science Building on the Thurgood Marshall Campus at the University of California, San Diego and boasts an interdisciplinary academic staff comprised of specialists in a wide variety of fields.